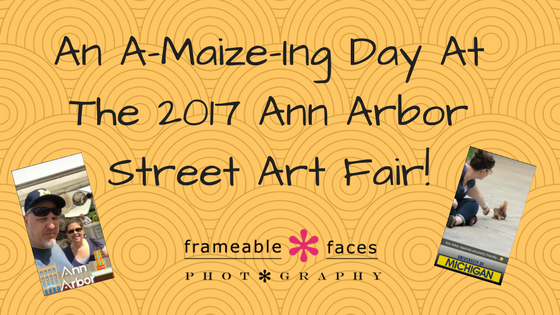 An A-Maize-Ing Day At The 2017 Ann Arbor Street Art Fair! This post is just a fun quick one about our day at the Ann Arbor Street Art Fair! As photographers we appreciate all things visual, as admirers of art we appreciate all things creative whether visual or otherwise sensory in other ways, and as Frameable Faces we celebrate living a life you would want to celebrate – one you would want to remember and capture. We think strolling through an art fair fits into what we do here in plenty of ways! The 2017 Ann Arbor Street Art Fair! Meanwhile I felt a blog post would be a good place to post our snapchat story from the day and include the links to the websites of our favorite artists from the day and have them in one spot. For starters you should get to the Ann Arbor Street Art Fair one July if you’ve never been – it’s a 4 day event that takes over a good part of the University of Michigan campus and parts of downtown (which is adjacent to campus). 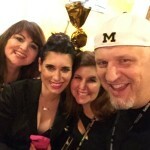 For those of you who may not know, the University of Michigan colors are maize and blue – hence the “a-maize-ing” title! Some cool stuff right? And how funny was that squirrel? And we had to throw in the spot where Ally and I bumped into each other once in Ann Arbor during our college years in front of Ulrich’s…. First we have the sculptural weaving of Gloria McRoberts from Watertown, TN whose fiber sculptures are hand woven from natural, undyed wool. We were really drawn to her booth and these awesome pieces. You can visit her website here. Next we came across these amazing sketchings on skateboards done by simple pen or pencil by Jeffrey St. Romain who is from New Orleans. My favorite was the one you see of Jimi Hendrix with the lyrics from Castles Made Of Sand. Here is his website. Next you saw a piece from Erika Bushee and her Art Rocks Studio – stunning. The rocks jut out from the surface and in the case of the one I snapped above, continue right onto the floor. Really cool. Last but not least the piece which kept people talking on Snapchat for 24 hours and on into our Periscope community was the amazing guitar tree by Demi Heitzman who is located not far from Toledo. 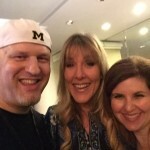 Here is her website. We also would like to call attention to an amazing underwater photographer we met (even though I did not get any of his work into the snapchat) named Chris Gug. Wow. Just wow. Check out his website here. We’re also giving a shout out to our favorite new plant based restaurant in Ann Arbor – The Lunch Room! OMG – delish right down to the deserts (VEGAN DONUTS!!!). Check it out – here’s the website. And there you have it! A GREAT day at the Ann Arbor Street Art Fair! We hope you enjoyed the highlights! 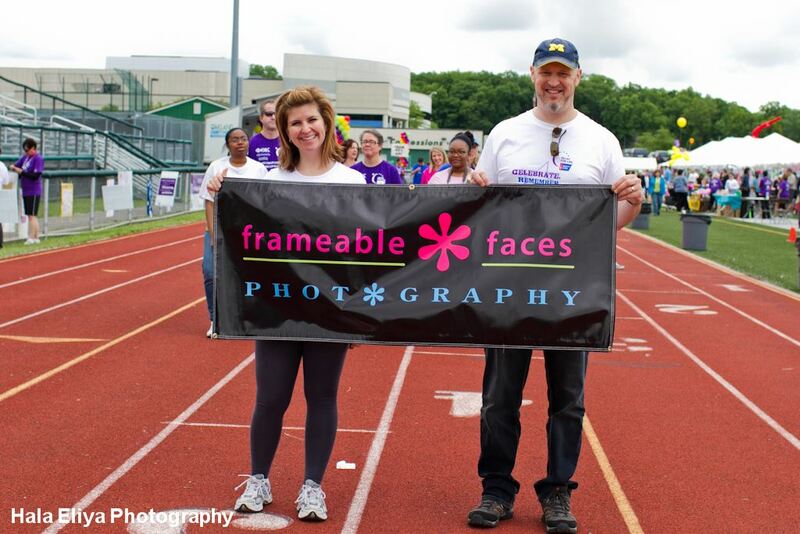 Relay For Life West Bloomfield 2014 – Team Frameable Faces! 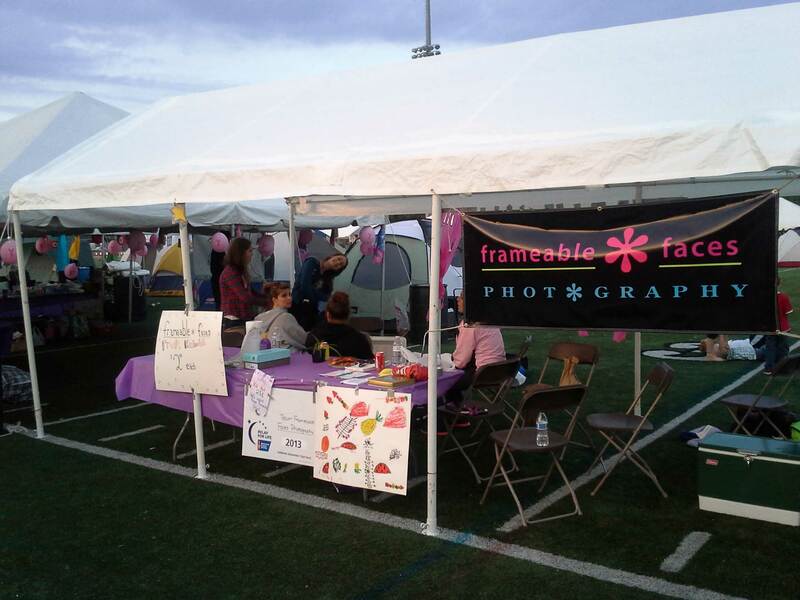 Relay For Life West Bloomfield 2014 was another successful and meaningful day for Team Frameable Faces! This year we set out with a goal of raising at least $1500 to fight cancer and we are happy to say we reached our goal! 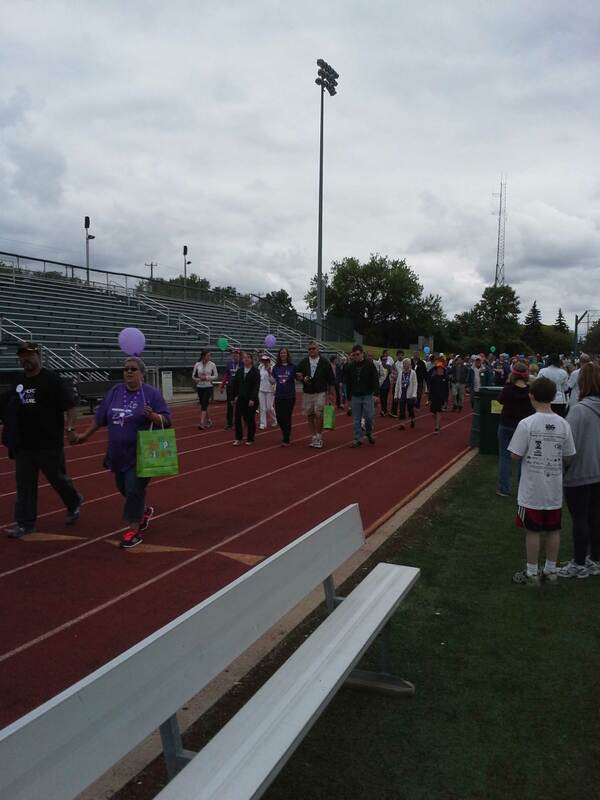 Our friend and member of our team Kelly Taylor who manages the Orchard Mall joined our family for the team lap at the beginning of the day in the photo above. This year’s theme for Relay was “Relaywood” and every team had a movie theme. 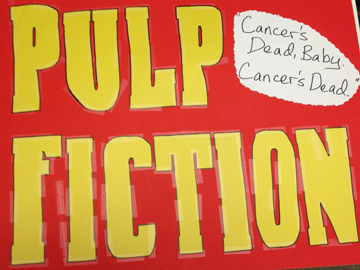 If you follow our blog you may know based on this post we are big fans of Pulp Fiction so that’s what we chose. Our tag line was “Cancer’s Dead, Baby. Cancer’s Dead” (as opposed to Zed). We had Marsellus Wallace’s briefcase at our tent which may or may not have contained the cure for cancer. It’s still a mystery what’s in that briefcase… We were also joined by Saundra Hood who generously donated her time for massages at a dollar per minute. 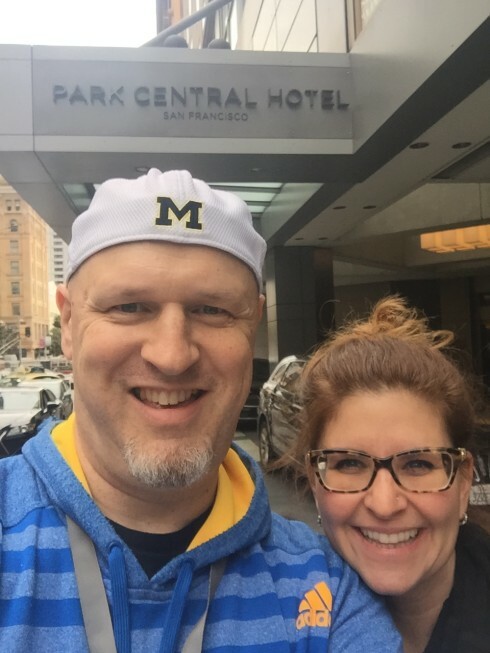 In the film a gangster who went by “Tony Rocky Horror” was tossed over a 4th floor balcony for allegedly giving Mia Wallace a foot massage so we stayed away from foot massages just to be careful – haha! 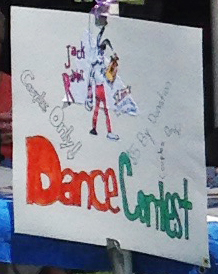 We also may not have had any Big Kahuna Burgers or 5 dollar shakes but we did have a Jack Rabbit Slim’s dance contest – here is a vine of our winners – the Freedlands! 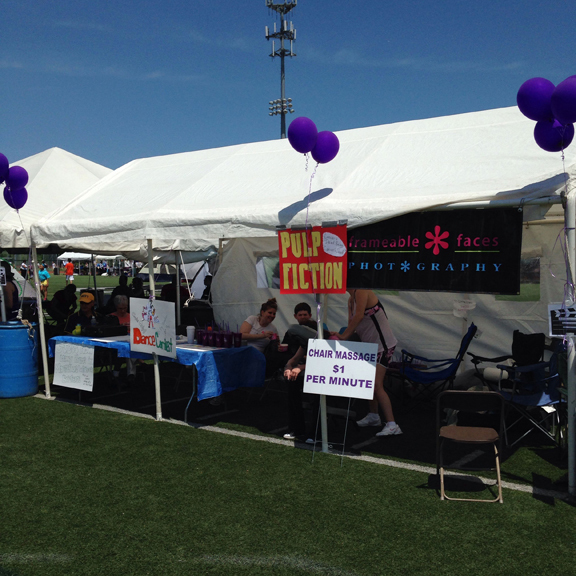 Highlights of Jack Rabbit Slim's dance contest at the Frameable Faces/Pulp Fiction tent at Relay For Life! Here’s a photo of our tent and you can see our Pulp Fiction sign along with our Jack Rabbit Slim’s sign and Marsellus Wallace’s briefcase. Every team also has a type of cancer they focus on and each type is associated with a color. 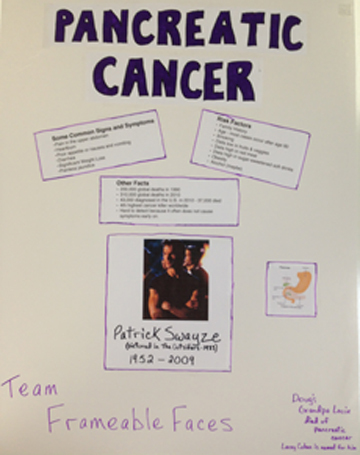 Here is our poster for pancreatic cancer with the color purple and in keeping with the “Relaywood” theme that’s Patrick Swayze on our poster who died from pancreatic cancer. Lots of our peeps stopped by throughout the day including our fabulous event photographer Angela, and one particularly special moment for us was when we had one of our spokesmodels from each of the last three classes at our tent at the same time! From left to right below Rachel Morof from the upcoming class of 2015, Erin Ben Moche from the just-graduated class of 2014 and Sierra Stone from last year’s class of 2013! Here is a collage of the day we posted on Instagram. 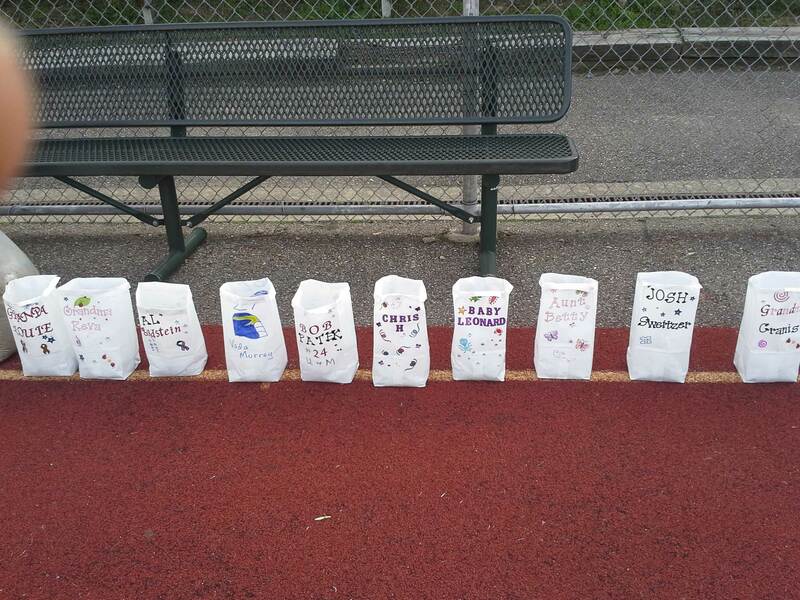 Ally and I have been touched by this awful disease with too many family members and an increasing number of friends – my Grandpa “Louie” Ackman, my Godfather Al Goldstein and Ally’s Grandma Reva Levine all were taken from us by different forms of cancer and here is a close up of the photo in the collage with luminaria bags now representing four of my former teammates at Michigan who are all gone way too soon. That number is just way too high…. 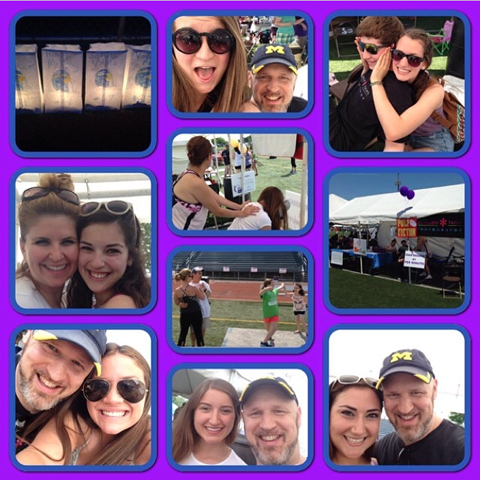 So as I said it was a memorable, meaningful, and emotional day at the Relay For Life West Bloomfield 2014. But the weather was perfect and we had a lot of fun too. 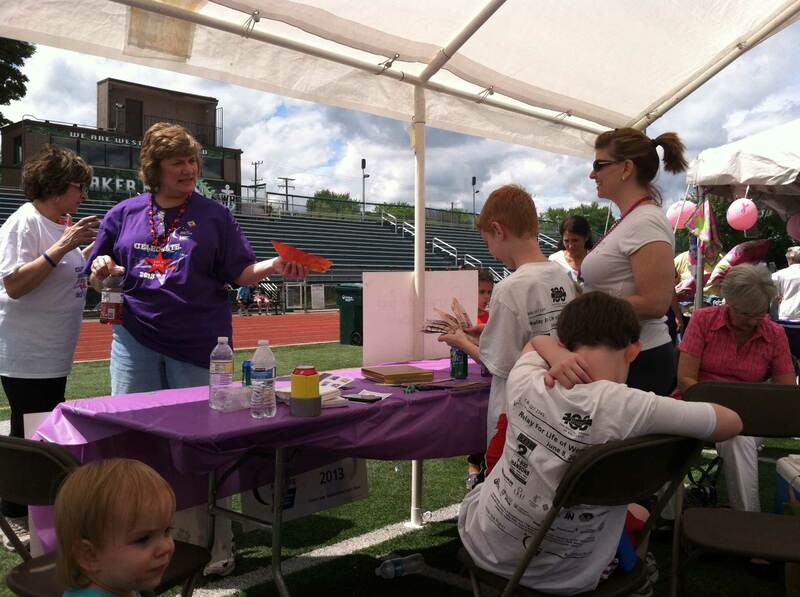 We hope to see you next year at the 2015 Relay to help FINISH THE FIGHT! 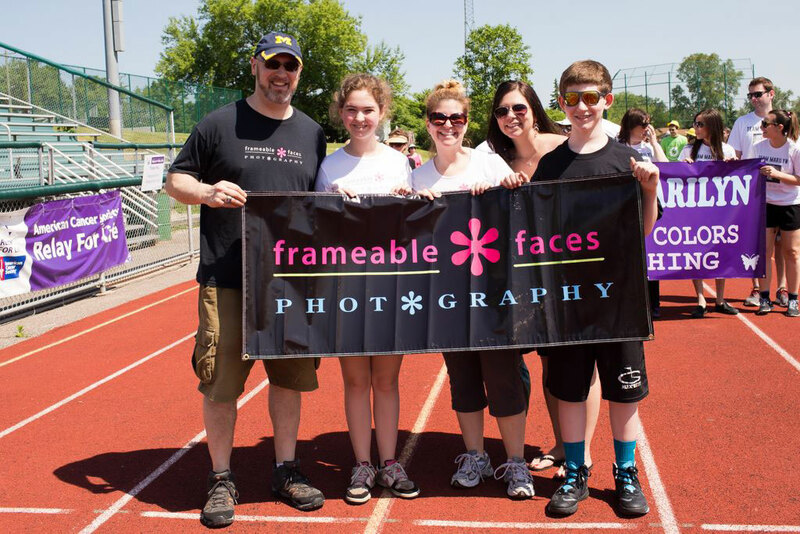 Relay For Life West Bloomfield 2013 – Team Frameable Faces! As pretty much everyone has, we have certainly been touched by cancer in our families and with our friends and so we thought it was time we did something about it – using our brand and our resources to try to raise money to make a world with more birthdays and less cancer, and for our first year I am happy to report we raised almost $1500. Just so you know you can actually still donate to the cause for this year’s relay through August 31st if you like at our team page. 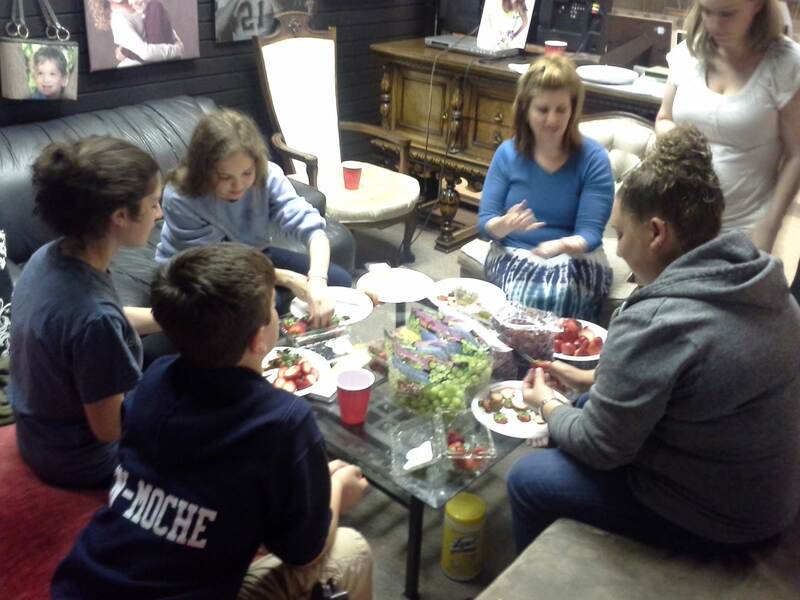 We had a few partners worth noting who helped us – we did fundraising days at Zoe’s House Of Pancakes and Leaf & Berry, and Hiller’s Markets donated fruit which we made into fruit kebobs and sold at the Team Frameable Faces tent at the Relay. Disclaimer – the following photos were snapped with a Droid and are of varying quality, but they are included here to tell the story of the day. 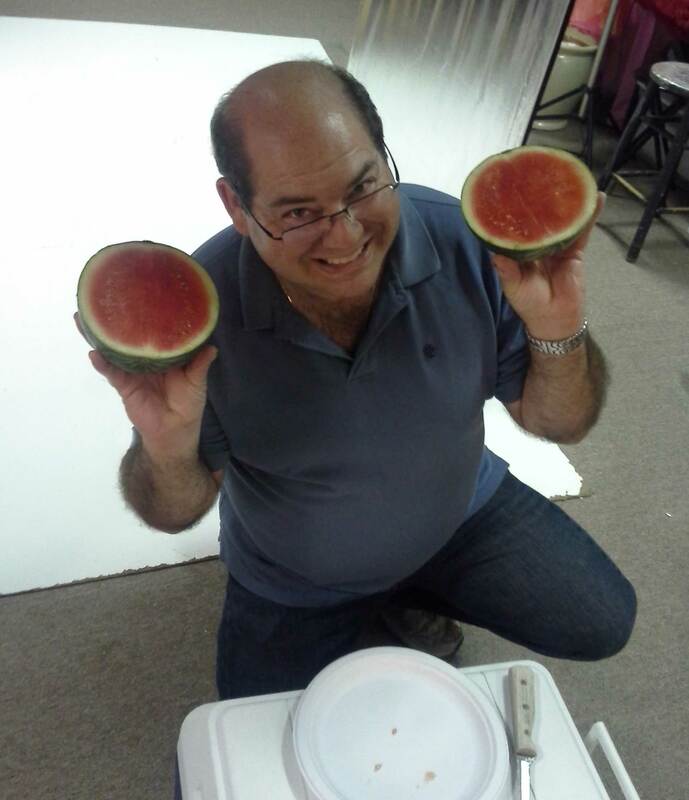 Joel Ben-Moche cuts up some watermelon! Yum! 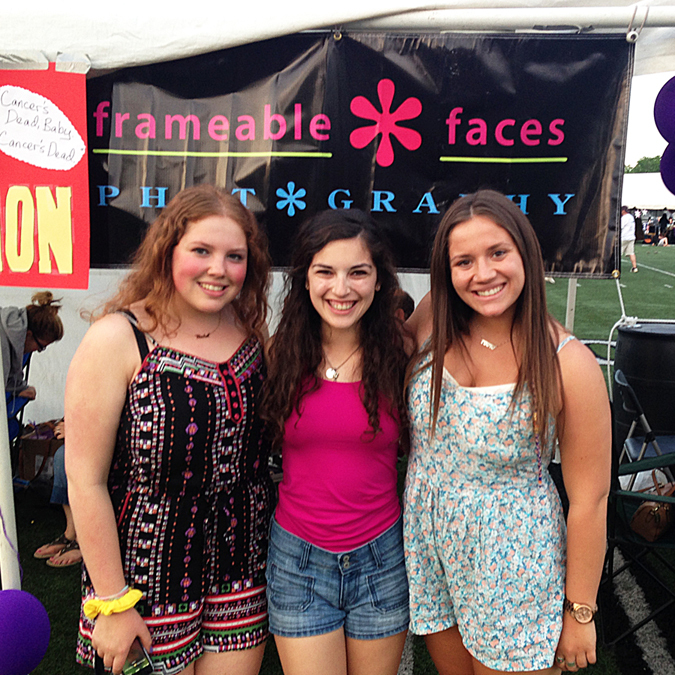 We spent the day manning the Frameable Faces tent with our team! Fruit Kebobs!!! Get your fruit kebobs here!!! 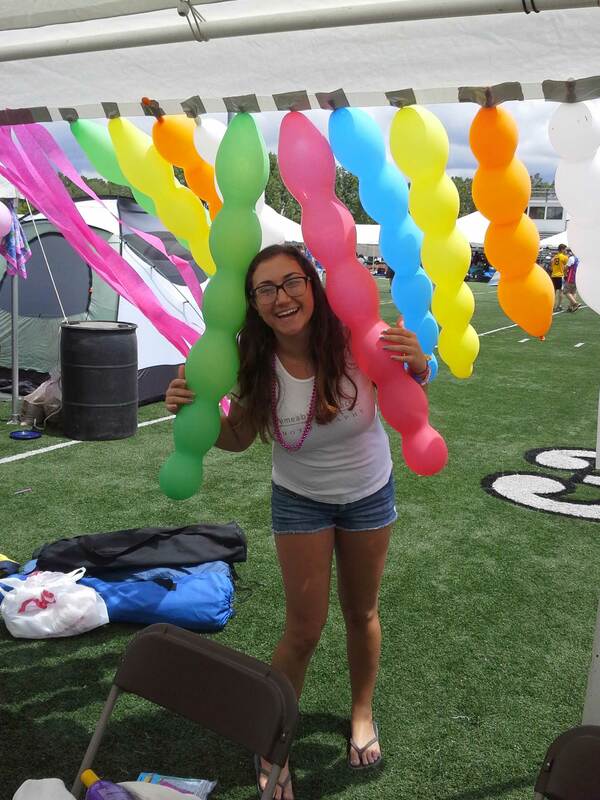 Frameable Faces Senior Carly Simko shows off her awesome decorations! JC Sidaway sells origami canoes to raise money to fight cancer! Okay this was amazing…. 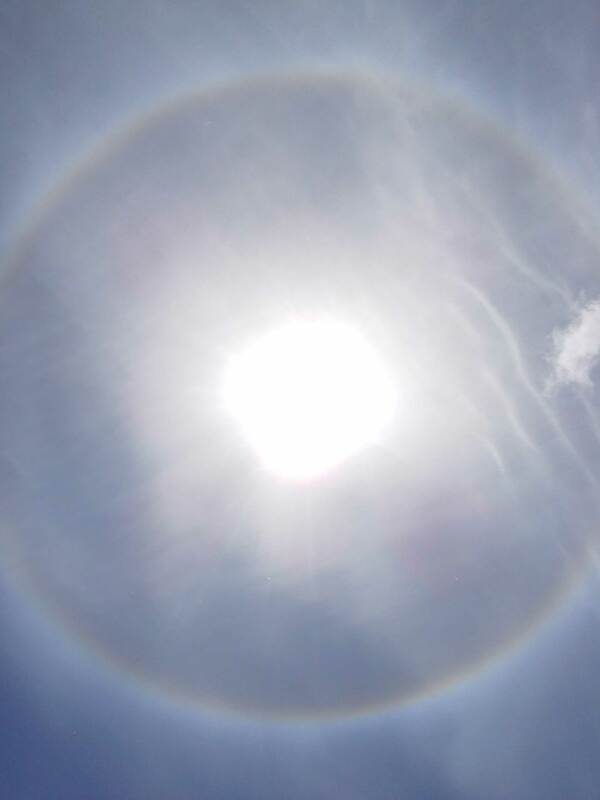 on a day when people spent a lot of time remembering those who lost their battles with cancer an amazing rainbow circle around the sun appeared directly above the event…. 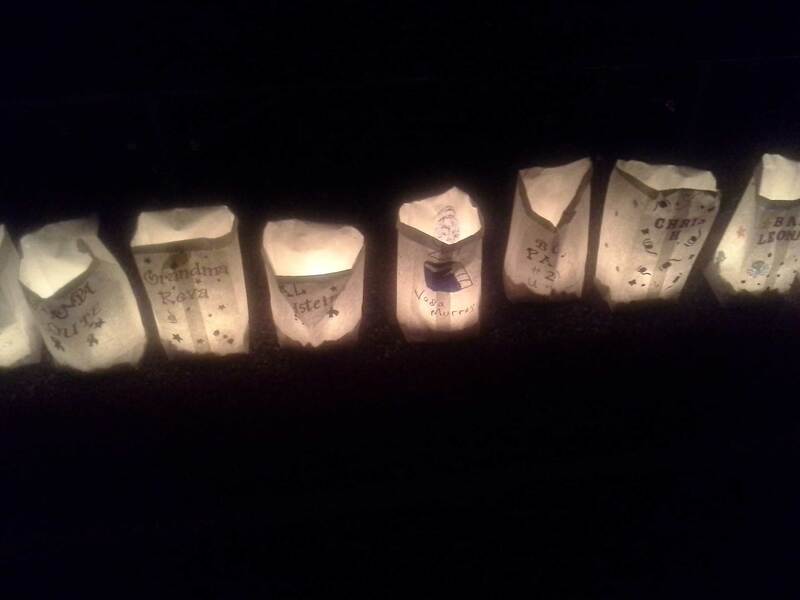 We then decorated luminaria bags in memory of those we’ve lost, and then the entire track was ringed with lit bags at night time while everyone walked a lap in silence. An extremely touching and powerful moment. 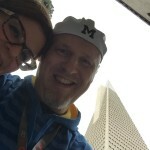 The Relay is a 24 hour event and Ally and I spent about 17 hours there. Now that I’ve done it I get how special it is. I don’t have a good reason why I hadn’t been before. There was a nice turnout of people, but frankly there weren’t enough. 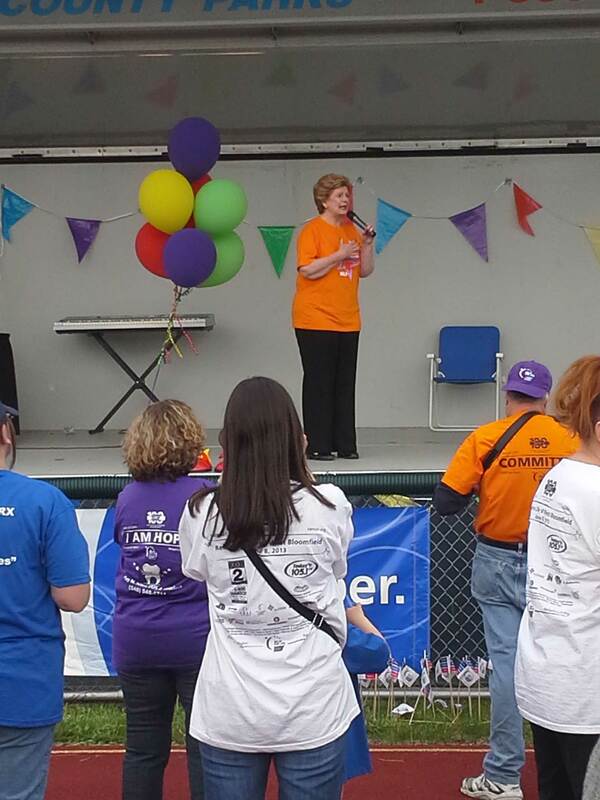 There is no good reason or excuse for not going to your local Relay For Life. You don’t have to have the means to donate huge chunks of money in order to attend. No one will hound you to give. But you certainly can give, and you can certainly support the cause even if it’s in spirit. Even if you just come hungry and eat at the Relay – every bit helps. 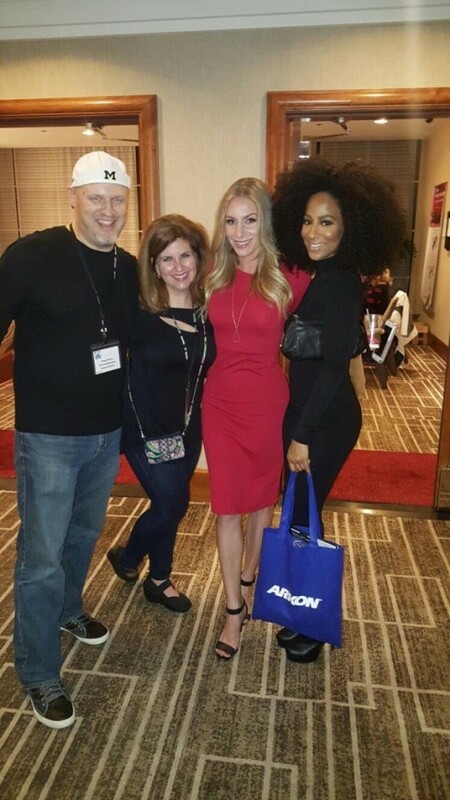 You will see a ton of people you know and you will feel a really nice sense of community. As for Team Frameable Faces this year was a good start but we can absolutely do better. We truly hope you will join us next year as we come together again to CELEBRATE, REMEMBER, and FIGHT BACK!